The Perkins 1300 Series engine family continues to meet customers reliability and superior engine performance. 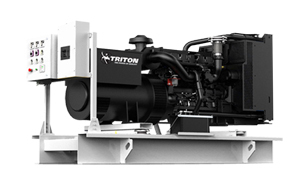 The 8.7 litre, turbo charged air-to-air charge cooled, in-line 6 cylinder engine features hydraulically-actuated electronically controlled unit injectors with electronic engine management available. Constant electronic engine management and monitoring enable precise fuel monitoring and injection timing to ensure low temperature starting and very close governing. The units have been manufactured for territories complying with EU2007 (EU97/68/EC) Stage II emissions regulations. Perkins diesel motors are economic with durable operation at prime and standby duties required by the power generation industry. The control panel, service doors and canopy board adopt a waterproof design and effectively stop rain and dust intrusion. Anti-vibration mountings between the engines, alternators and the base significantly reduce the vibrations during operation, ensuring stable operation. All movable devices are fixed firmly, and therefore help reduce vibration. The machines are equipped with monitoring system, helping monitor the operation at real time. We provide DSE-7420 control module for your operation. The double protection for the cable connection panel lowers the probability of leakage caused by unintended touch or water intrusion. Three-dimensional CABLING design for all the generator cables, providing reasonable, accurate and perfect protection. Automatic turn-on circuit breaker with under-voltage protection system inside maximally avoids mistakes. Automatic control module for multi-directional monitoring meets multilevel demands and considerate protection of or for customers. The radiator and high-voltage parts are guarded to avoid accidents caused by touch. The control panel is lockable. Current changeover switch, voltage regulator and circuit breakers are installed behind the door. Anti-vibration rubber mounts are installed in the two sides of the doors to avoid damage to the machines when open the doors. The noise level can be reduced by 15-35dB(A) through multiple noise control devices, which enables quiet operation and has no effect on daily life. This feature makes our diesel generators ideal for use at night, in residence, office and other environments sensitive to noise. Cleaner exhaust, less effect on the environment, even in outdoor application. Adopts world-famous engines, with low noise and low emission. Rigid structure ensures lowest vibration. Common rail system: (for some models) significantly lowers the combustion temperature, and also leads to cleaner exhaust. Silencer and muffler pipe system dramatically reduce the noise during operation, and therefore cause less effect on daily life. The interior is lined with new type fire retardant and sound absorbing material. The door is airproof with rubber seals specific for car doors use only, which helps absorb massive noise and heat during the operation. Besides applying airproof rubber seals around the doors, the concept of noise reduction has also been fully integrated into the inlet/outlet and other aspects. Multiple languages for option, automatic control. Connected with mains through ATS, which can help realize automatic transfer between the mains and the generators. Also, multiple generators can be paralleled for bigger power need. 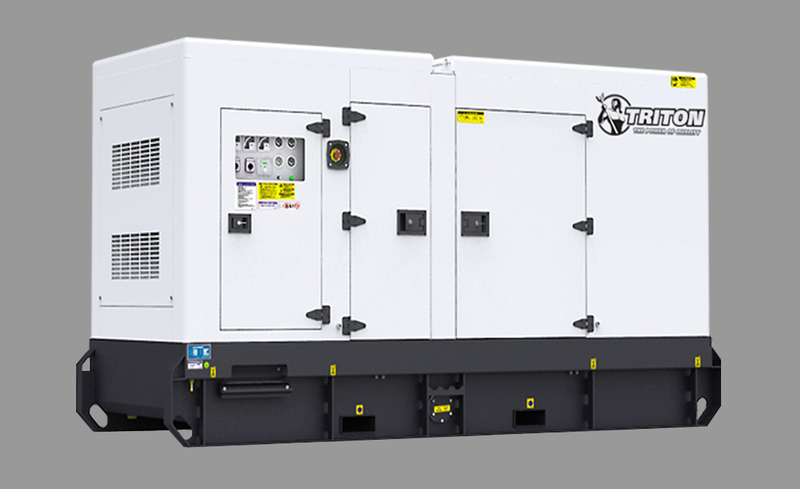 8-12 hours based fuel tank in soundproof generator sets prevent against leakage and fuel spray when cleaning the interior. The fuel tank abides by European environment protection standards. The oil drainage pump is located in the side door for easy operation. New type waterproof door lock is easy to lock and open. Clear labeling in visible positions, providing adequate information, safety presentation and convenience for operators. The labels are made of advance materials, featured with excellent high-temperature resistance, rainproof and weatherproof performance. Terminal connection lugs (L1, L2, L3, and LN) make connection and wiring more simple and well-ordered. Emergency stop provides convenient operation in emergent situation and when servicing. The machines below 500kVA have holes for forklift and dragging in the base for easy transport. Lifting eyes located on top of the canopy make easier move by cranes. The daily maintenance work can be performed on both sides of the machine, and wide door allows you easily get in touch with the machine. An integral base drainage outlet located at the bottom of the machine makes easier regular maintenance. For generators above 300Kva, a ladder for climbing is equipped. It makes easier to check and service.